Rajinikanth Supported Dhoni-led CSK Yesterday! The Indian Premier League or IPL 2019 has kick-started on a high note. When it comes to the game of cricket, we Indians, as we all know to leave no stone unturned to make it grandeur. The energy among the cricket fans was quite high yesterday during Chennai Super Kings VS Royal Challengers Bengaluru match at MA Chidambaram Stadium. The crowd in the stadium went berserk when they came to know that Superstar Rajinikanth was at MA Chidambaram stadium to support Thalaiva Dhoni. The clippings of Rajinikanth receiving a huge welcome by the fans are going viral on Twitter. 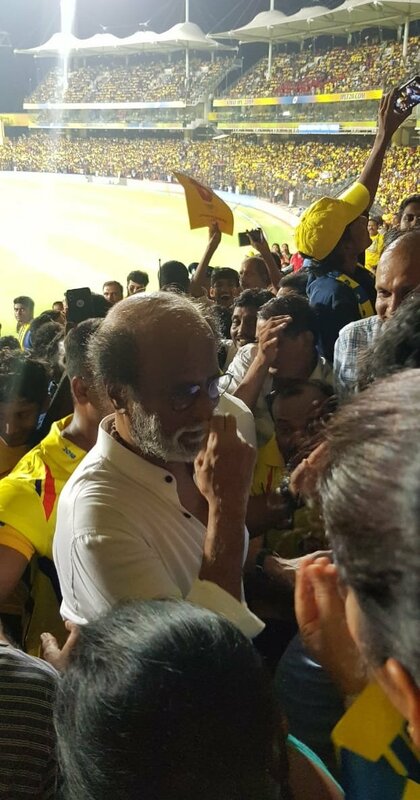 Fans couldn’t keep calm with Thalaivar’s presence at the stadium. Rajini was thronged by fans for selfies. It is learned that MS Dhoni and Rajinikanth, both enjoy massive fan following and the craze among the fans for the two superstars of Cricket and film fraternity was quite insane. Notably, Chidambaram Stadium hosted only one IPL match in the last four years and So, the excitement and love among the fans there were quite emotional yet electrifying the day before.